Buongiorno ragazze. 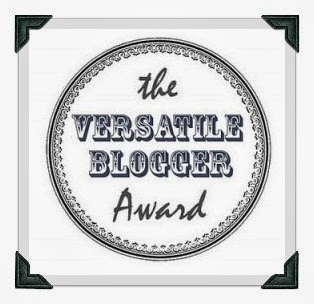 Questa volta ben due blogger mi hanno assegnato il premio "The Versatile Blogger Award": Emilia&Salento Effetto Moda e My life as Helder Pereira due care blogger che stimo molto. IT: "Il premio viene dato dai blogger a chi scrive post di buona qualità e interessanti, accompagnati da belle foto. Nasce per onorare chi porta qualcosa di speciale nelle vite altrui"
ENG: "The versatile blogger award is an award given to you from your blogger peers, for writing quality posts that have somehow touched them, having good quality photographs, and the uniqueness of the subjects covered. The award is to honor the bloggers who bring something special to your life." Thank the blogger who gave the award and link to their blog. Share seven things about yourself that people may not know. Give this award to up to 15 bloggers. Comment on their blogs to tell them of the award.